Hairstyles that can Make you Look Thinner. When it comes to improving our appearance we are always searching for the fastest and most effortless ways to achieve our goals. While quick fixes often fail to deliver the results we expect, sometimes even the slightest changes can produce noticeable positive effects. Find out how smart hairstyles choices can make you look thinner. Looking younger and thinner are two common desires that many women tend to have at certain points in their life. While we might be tempted to believe that our hair styling choices and our weight have few things in common, the truth is that some hairstyles can make us look thinner compared to others. Just like in the case of clothes, the structure, length and even color of our hairstyle can work in our favor helping us project the image we want others to perceive or, on the contrary, it can do us a big disservice and become a source of frustration and dissatisfaction. Selecting a hairstyle according to our facial features is generally a great first step but if we want to adjust our look even more it is necessary to learn which are the additional things that are needed in order to get closer to our goal and get the desired image we want to project. While each woman has different needs, there is a set of principles that can apply to most situations when it comes to trying to appear slimmer by paying attention to which types of hair styling techniques or hair cutting techniques you decide to adopt. Long hair length is one of the most inspired choices you can make due to the fact that it can create the most striking differences when it comes to perceptions. In fact, short hairstyles and medium hairstyles that end at the chin line or above it such as certain bob hairstyles usually fall in the no-no category when trying to visually subtract a few pounds. Adding layers is another good idea to create a little bit of structure as well as natural volume to the hair. The style of the layers is less important when it comes to looking slimmer, however you should be careful at the length of the layers. Make sure that the layers surpass the chin line to be able to reduce the width at the cheekbones level and thus make your hair appear less wide. If you like to add bangs to frame your facial features even more, make sure that you stay away from full straight across bangs that will reduce the overall length of the face. 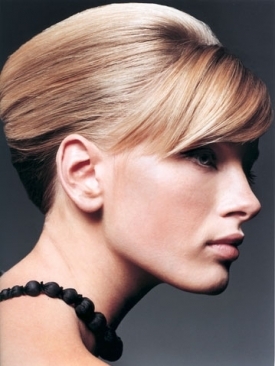 Stick to side swept bangs to be able to perk your style without compromising your efforts. Adding volume at the top of the head is also highly recommended as it will draw the focus in a different area lifting your face and emphasizing your eyes as well as your forehead. If you boost hair shine in the process, the effects will be even more pronounced. However, if you don't have a lot of time to create a complex hairstyle, you can also create a slimming effect by opting for a side part. Adding highlights is another great idea since a contrast between colors will create a shading effect that will support the image you are trying to create. Although the haircut style is a lot more important than the color of your hair, an added depth and dimension can give you the result you've been looking for with little effort. In terms of the hairstyles that create the biggest impact when it comes to creating a slimmer appearance, high ponytail hairstyles, French twists, loose curl hairstyles or soft wavy hairstyles are definitely some of the top choices you should consider when selecting your do for casual as well as formal events. High ponytails have the ability to show off beautifully sculpted cheekbones and to add height at the top of the head, French twists are the ultimate example of a face slimming updo while waves and curls create just enough volume to glam up even the simplest hairstyle while not creating unnecessary heaviness as it might be the case with curly hairstyles. 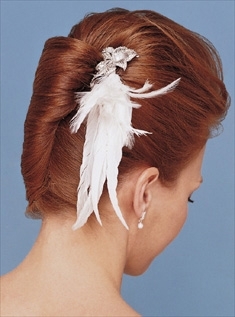 Hair accessories can also help a simple hairstyle stand out and make you appear slimmer. The secret when it comes to using hair accessories to your advantage is their placement. The closer to the crown of the head you manage to place them, the greater the effect will be, so don't hesitate to take advantage of these wonderful tools to create sophisticated and stylish hairstyles.